In their unrelenting viciousness, the Right Wing unleashed an attack ad filled with brooding malice and fabrications, tying Senator Barack Obama to former Weather Underground leader William Ayers. "One of the group's leaders, William Ayers, admits to the bombings, proudly saying later we 'didn't do enough.' (Text on screen: New York Times, 9/11/01) Some members of the group Ayers founded even went on to kill police. (Text on screen: "'Weather' Fugitive Is Seized In Killings' -- Associated Press, 4/17/08; New York Times, 10/22/81) But Barack Obama is friends with Ayers, defending him as 'respectable' and 'mainstream'." What the Right Wing doesn't know is that for every melodramatic, B-movie trailer, conspiracy-theory attack ad against Obama, the Left Wing blogosphere is going to respond with an equally over-the-top parody on McCain. Because, here's the thing, we have credible evidence that John McCain is secretly working with the Northern Vietnamese communists. That's right, John McCain is a Charlie sleeper and he's right on track to become, gasp, the next President!?! Many people know that John McCain spent five years in a Vietnamese prison camp, but the truth is coming out of the closet now like Mark Foley or Ted Haggard. You see, during those five years of imprisonment, the Vietnamese installed a microchip in John McCain's head using a crude shank. McCain wants to ascend to the presidency so he can use our nuclear arsenal to destroy America and all of your friends, and all of your wives, and your innocent little children and your little dog floofy. McCain voted against increased funding for veterans' health care in 2004, 2005, 2006 and 2007. He voted against an assured funding stream for veterans' health care in 2006, leaving it all up to chance for our nation's heroes. McCain was one of only 13 senators to vote against an "additional $430 million to the Department of Veterans Affairs for outpatient care and treatment for veterans." He voted against establishing a $1 billion trust fund for military health facilities. He opposed $500 million for counseling services for veterans with medical disorders. He was also having an affair with his current wife, Cindy McCain, while he was married to his last wife. This partially confirms that he is an agent for the Vietnamese and at least a man who has no family values. 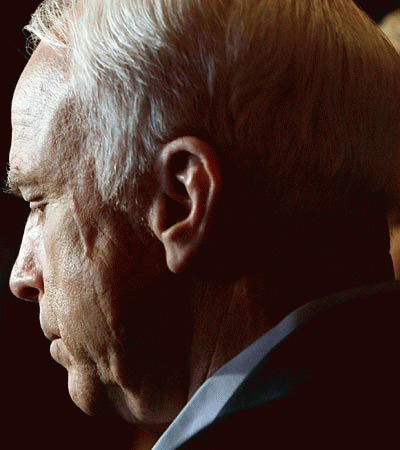 There are more opportunities to sling mud and filth at John McCain than there are with Obama. So McCain better squash 527s from airing deceptive filth or face a fearsome, albeit humorous and entirely amusing, political counter-attack.